Directions: Apply cream directly to acne, pimples and blemishes. Allow cream to absorb into skin. Avoid excessive facial rubbing. The Red Spot Balm Kit comes with a jar of 20ml Red Spot Balm, a tube of 5ml Pink Daily Spot(Review here - [link]) and a plastic spatula. 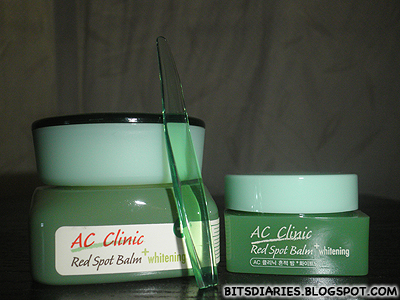 I have the Red Spot Balm in smaller version(5ml) which I got it from the AC Clinic Pink Powder Spot Kit. :D FYI, the container of full version is made up of sturdy glass whereas the container of small version is made up of plastic. 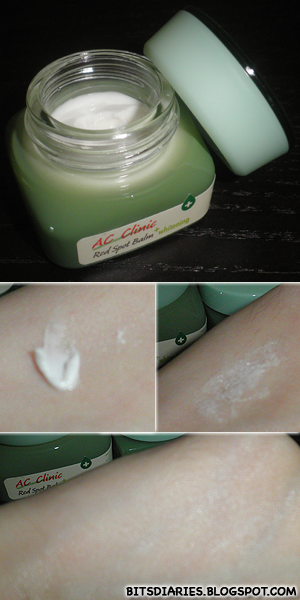 The balm has a creamy balm consistency and is in white color. When I gently massaged the balm on my skin, it will turned from white to opaque and with continue massaging, it will turned to nearly colorless. Herby? Medicated? smell... It's bearable. It's not as strong as the Pink Powder Spot. 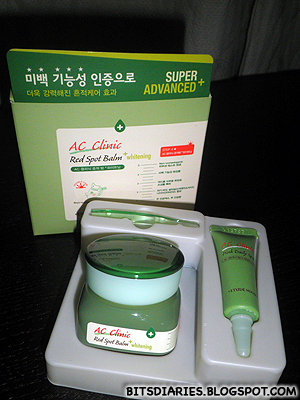 I used this only at night because I believe our skin heals better at night while our body is at rest. :x I don't want to rub it excessively on my skin so normally I will just gently massage it on my skin and leaves a white layer to cover the marks. Therefore, I won't apply this in the morning. By the way, I do not recommend to apply this if you're going to apply make-up afterwards because this balm tends to leave a layer of balm on your skin after application. On a positive side, this does helps in speeding up the process of fading post acne marks/hyperpigmentation! I have been using this for about a month and 3 weeks. I noticed my pigmentation marks have lightened a lot and some have already gone. I believe this jar of 20ml Red Spot Balm can last really long because you only need to apply a little on the acne marks/hyperpigmentation. 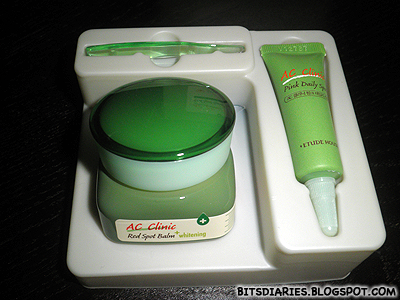 If you ask me if I will repurchase, I will definitely say YES! :) I am really happy that I got this balm and I highly recommend this to people who wants to get rid of acne scars/marks/hyperpigmentation. Thanks for the review.. I just bought this with the foam cleanser. hope it will work for me too and fades my acne scars.. What a nightmare! Friend, I am Sachin, when I have suffered from acne scar then I search many clinic centers for our acne scar treatment and I also take their service but I did not satisfy from their treatment. Then I listened about best clinic in Delhi klinikesthetika. I visit there and I take this service and I find a best treatment in Acne Scar Removal in Delhi. Now I am very happy with this treatment. Thanks for klinikesthetika clinic.